Discover the innovative range of skincare inspired by traditional Chinese medicine from SkinPointEight here at Mankind. 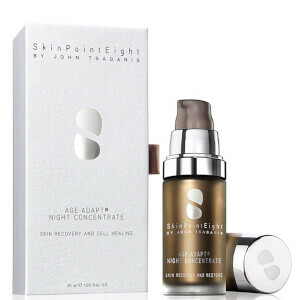 Made by John Tsagaris, an internationally renowned doctor of traditional Chinese medicine, SkinPointEight boasts beauty enhancing and anti-ageing properties. After years of research, he released his skincare collection which is based off a range of herbal actives and the therapeutic effects of herbs on the skin. The SkinPointEight Gentle Foam Cleanser is a revitalising, anti-ageing face cleanser made to eliminate impurities. Gentle yet effective, it encourages renewal of the skin’s epidermal layer, boosting the skin and accelerating skin turnover for a younger looking complexion. Formulated using natural fruit acids, lactic acid and a Proteo-lytic enzyme complex, this non-irritating cleanser removes daily grime and impurities for clean, clear and fresh skin. The SkinPointEight Age-Adapt® Night Concentrate is a rich serum which soothes skin and restores its renewal abilities. Working when skin is most receptive to repair, it restores natural antioxidant resources to transform skin overnight. Formulated using amino acids, ascorbic glucoside, hyaluronate, fatty acids, Chinese herbs, salvia leaf and chlorella vulgaris, this multi-tasking formula provides an array of benefits and seals in moisture. Delivering hydration, it also visibly smoothes fine lines and wrinkles, combats uneven skin tone and protects against environmental stressors for normalised, comfortable and calm skin.